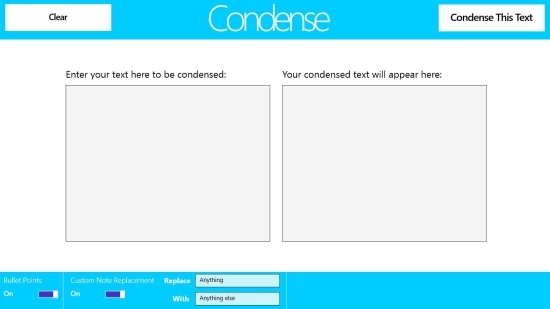 Condense is a free Windows 8 Notes Maker app that creates simple and easy to read notes out of a large chunk of text. The app efficiently converts large text paragraphs into point-wise bullets in seconds, thus making it more readable. With this free Windows 8 Notes Making app, you don’t need to actually go through long paragraphs and spend hours to make notes out of them; just make a click and you are done! Condense is very efficient, fast yet a handy tool. Apart from creating notes out of text paragraphs, the app is also integrated with other useful features such as custom note replacement and character count. Not just this, you can also edit notes further. The app is freely available in Tools category of Windows Store. You can also view the app directly in Windows Store using the link given at the end. Let’ have a look at how you can use this free Windows 8 Automatic Notes Maker app. Using this free Windows 8 Notes Maker app to make easy notes is extremely easy. All you need to do is to put the desired text in the text box. The lengthy text will be converted into simple notes with just a single click. To use the app, first install it on your Windows 8 system. As you launch the app, you will see the main screen of the app with two text boxes. Put the desired text paragraph in the text box placed on the left side of the screen. Click on Condense This Text button placed on the top right corner of the screen. The app will instantly convert the text paragraph into simple notes and display these notes in the text box placed on the right side of the screen. Below these text boxes, you will find options of Bullet and Custom Note Replacement. You can keep Bullets option on to created notes with bullets. The Custom Notes Replacement option lets you replace a word in your notes. As soon as your notes are created, the app also counts and displays the number of characters in the notes. Use Clear button placed on the top left corner of the screen to clear the text boxes. Also check out The Colour Notes and Note Anytime. 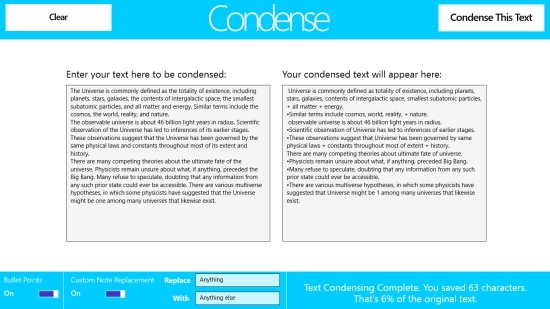 Condense is an awesome free Windows 8 Notes Maker app to make automatic notes out of long text paragraphs, which can be easily edited further. The app will save you from hours of work. However, you can’t save notes directly in the app. Instead, you can copy paste these notes to a word file and save them on your system. Definitely worth trying an app! Do give it a try and share your feedback via comments.